Lion Diplomat President Madeline Martin ’18 is an art and psychology major, who also serves as lead residential assistant for Smith Hall. 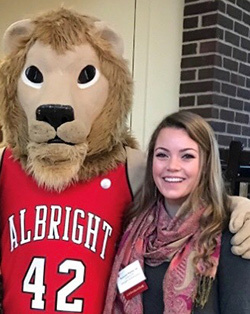 She’s an Albright Ambassador, member of the President’s Student Advisory Council and a student assistant in the office of Alumni and Donor Engagement. Martin is enthusiastic about the work that the Lion Diplomats do and is proud to be leading the group. Who are the Lion Diplomats and what do you do? The mission of the Lion Diplomats is to bridge the gap between alumni and current students. We try to accomplish this by assisting the Alumni Relations Office with events that facilitate active relationships between alumni, alma mater and students. For example, we attend Alumni Association Board meetings and maintain contact with alumni through the Cub Club program, where we mail birthday cards to the children of alumni as they celebrate their 5th, 10th and 15th birthdays. The Lion Diplomats also raise awareness of the importance of giving back to the alma mater by hosting annual philanthropic events. What are some ways the Lion Diplomats help connect alumni to alma mater? As president, I attend the Alumni Association board meetings, share what is happening on campus and talk with alumni about events that they might consider participating in. For example, the dips are hosting an Experience event in the beginning of April, at which five Alumni Association board members will talk about their philanthropy and post-Albright lives. Alumni are also asked to be a part of service day, which takes place during Alumni Weekend in April. What is your biggest goal for the Lion Diplomats this year? My biggest goal is to have all legacy students—students whose parent’s graduated from Albright—join the dips. Also, I would like more of the student body to know who we are and what we want to accomplish. What is your favorite part about being a Lion Diplomat? Getting to meet alumni and learning how campus life was during their years at Albright. I also love going to board meetings because it really helps me feel connected to alumni. They are so kind and truly want to be involved in students’ lives. What else would you like alumni to know about the Lion Diplomats? I am so grateful to our alumni for their support and donations to the College. Without them, I would not be able to succeed and be on the road to achieving my undergraduate degree.